For the first time ever, the Masters of Arabian Percussion presented on one album. Experience the thrill of the Tabla (also known as Dumbek) in the hands of renowned artists from various countries including Egypt and Lebanon. These dynamic pieces represent the skills of the artists, complexity of the rhythms and are essential for familiarizing oneís self with Arabian percussion. 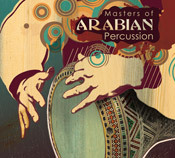 For the first time ever, the Masters of Arabian Percussion presented on one album. Experience the thrill of the Tabla (also known as Dumbek) in the hands of renowned artists from various countries including Egypt and Lebanon. These dynamic pieces represent the skills of the artists, complexity of the rhythms and are essential for familiarizing one's self with Arabian percussion.